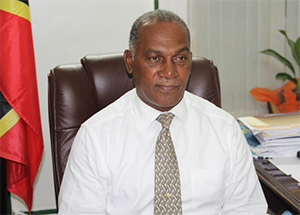 NIA CHARLESTOWN NEVIS (October 07, 2014) –Premier of Nevis Hon. Vance Amory returned to Nevis following a week-long visit to the United States of America, Canada and London. In a brief report on October 06, 2014 of his overseas tour of duty Mr. Amory outlined the activities he was a part of. “I just want to inform the people of Nevis that I returned to Nevis on Sunday after travelling overseas on official business, primarily to attend the Independence celebrations in Toronto which was hosted by the Consulate General Mr. John Allen and his staff, to celebrate the 31st anniversary of Independence. “That service was held on Sunday 28th of September and it was very well attended by citizens of St. Kitts and Nevis and friends and well-wishers including representatives of the Diplomatic Corps and representatives of other governments from the Organisation of Eastern Caribbean States (OECS),” he said. According to the Premier, at the end of the church service a reception to toast the nation of St. Kitts and Nevis was held. There was also an awards ceremony at which Mr. Ingleton Liburd and Dr. Elizabeth Artwell were honoured for their contributions to Sports and Education respectively. He also gave a statement at that ceremony. “I was able to make a brief statement in respect of how I see the independent nation of St. Kitts-Nevis and what I thought were some of the issues we need to look at, to ensure that we continue to enjoy our independent status as a Federation. “In that note, I admonished or requested as I am doing now, our people here in Nevis, to look at the manner in which we train our people; in which we teach our children in schools and to begin to refocus on the total development of our young people, starting with our young people in schools. It is clear that it is not too early to begin to talk to our children in kindergarten in the primary schools about good behaviour and we need to make that a focal point of our educational system,” Mr. Amory stated. The Premier also spoke of his visit to Boston. “I also went on a visit to Boston, where I was invited by nationals of St. Kitts and Nevis, primarily Mrs. Veronica Browne who is married to one of the Browne’s family who now lives in Boston, from Newcastle and they hosted a very town hall meeting. “We discussed the same issues of whether or not looking at economic development and physical development of our country, we are not missing the important ingredient of how our people respond and their attitudes and their attributes and their values which are the things which make for progressive societies,” he said. Mr. Amory noted that while in Boston he was introduced to an official of the Cambridge Hospital in Massachusetts, a high point in his visit to the United States. “I was introduced to the director of one of the largest hospital there in Cambridge with a hope that we could establish a link with that institution, to provide additional health care services for Nevisians, if they do require health care services overseas but perhaps more importantly, to see how we can do a twinning exercise with that Cambridge hospital, so that we could have the benefit of their professionals, whether to do training for us or to send people there to be trained in some areas. “I think that for me was the high point because always, we must recognise that the health and the provision of health services for our people has to be a priority. I was fortunate that Mrs. Veronica Browne is the secretary to the chief consultant in surgery and a sister of hers also has a very significant position at that hospital. They will be liaising through me with our health ministry, to see how we can establish that kind of link with the Cambridge Massachusetts Hospital to help to provide additional services for our people in Nevis,” he said. Mr. Amory explained, that his visit to the United Kingdom was in keeping with an earlier promise to return there for town hall meetings with citizens of St. Kitts and Nevis. “I was able to do a town hall meeting in Leicester. We had over 50 persons present. The discussions centred around our security, the unfortunate increase in criminality in Nevis and St. Kitts but we also looked at some of the positive things and looked at the new thrust in Tourism; the new thrust in economic development and increase in employment as we are seeing the turnaround in the Nevis economy. “Our citizens there were very receptive. They had their own questions and their own concerns and clearly one of the issues which was raised is the issue of good health services and I was able to assure them that the government is looking at upgrading the Alexandra Hospital, looking at restructuring the system at the hospital to ensure that we have an efficient medical service there and that our nurses will be trained to provide the dialysis skills which is so needed,” he said. The Premier added that every time he travelled overseas he was asked about the status of the dialysis system on Nevis. “I will not say much about it because this is the purview of Minister Brantley who is the Minister of Health and he himself has addressed that but our citizens are very concerned about it and we certainly have to respond and do so in a manner which will make our citizens here and those overseas, who will come back here, make them comfortable that we are doing all we can to provide an efficient good quality primary service,” he said. Mr. Amory also spoke of his meeting with potential investors during his UK visit. “The other matter I want to look at is the interaction with potential investors in England. I had one meeting which I feel, will bear fruit but I will have to leave that until I have invited the investors to come to Nevis. When they do come, we will unveil what we think is a very substantial investment which will take place. “I think this is what has to happen for Nevis to take off again. We must have an inflow of foreign investment in whatever areas, whether tourism, whether it is in the investment in the public sector investment programme, to provide infrastructure for our country. I want the people of Nevis to know, that we continue to ensure that we promote Nevis, that we keep our people informed and that we are doing what we can to ensure that Nevis is again on the rise and on the move,” he said.